Do you do push up every single day? Are you doing it to lose weight or just to tone your body? Regardless of your purpose, doing push ups gives your body tons of benefits. In fact, according to Keep In Spring, it activates your whole body. As a result, it increases your functional strength. However, many are still wondering about the exact number of push ups that they need to perform. In this article, we will answer the question – how many pushups should I be able to do? Before we go into the ideal number of repetitions, have you ever asked yourself why you do push ups? According to Hundred Push Ups, pushup is one of the basic common exercises that you perform. It is so simple that you don’t even need fancy gym equipment. In addition, it is best in toning your chest and arms. Moreover, it improves your upper body muscular endurance and strengthens both muscles and bones. 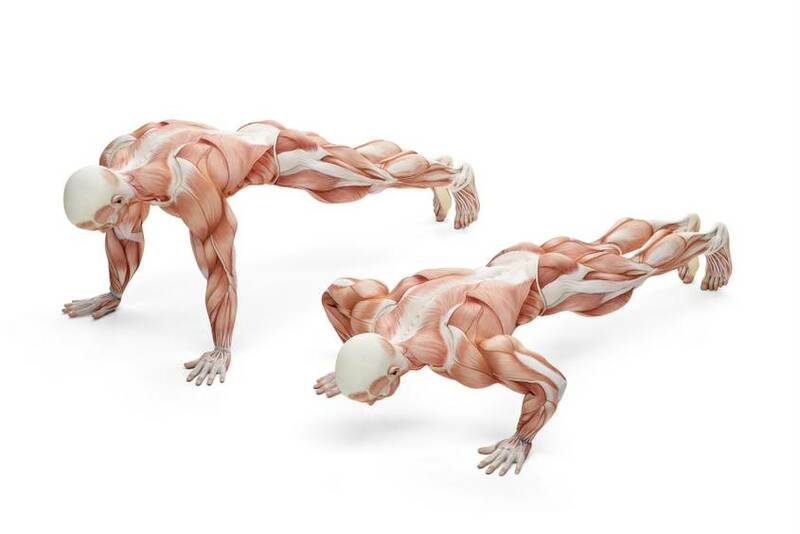 More importantly, doing push ups every day helps create lean muscles in your arms, chest, and shoulders. You might think that dropping your body on the floor and pushing it up and down is already a push up. Nah, buddy! By doing it the right way, you will be able to maximize its benefits and prevent injuries during a workout. Most people ask me about the ideal number of push ups that they should do. Honestly, I end up telling them a rough range of repetitions. Sometimes, I am guilty of simply telling them to do as many as their body can let them do. The answer to our million dollar question depends on as to who we ask. Experts, Military Personnel and Fitness Gurus, have different figures to say. You see, there are no published documents that tell us a standard figure. Dr. Lawrence A Golding, a professor of Kinesiology at the University of Nevada, is an expert in physical fitness. In a report posted on Physical Living, he concluded that males ages 20-40 years old must perform 13-30 push ups. I know what you were thinking. This is a pretty huge range. However, he provided additional details of push up test norms for men and women. 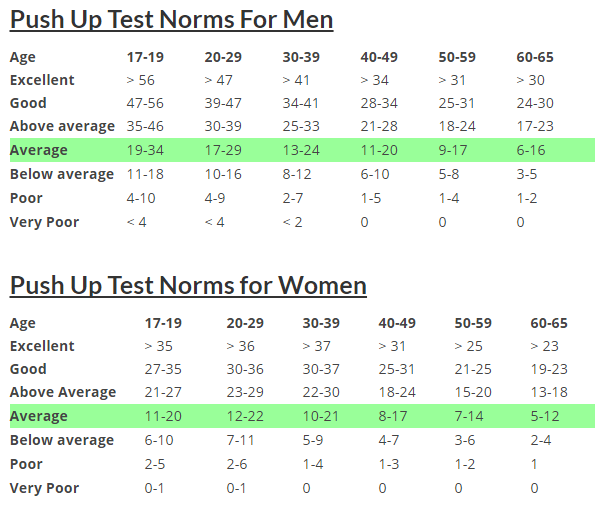 Based on the data, the number of push ups males and females can perform at their peak at ages 30-39. However, after that, it starts to decline as expected. Also, this data shows the different capacities of people doing the push ups. Gym enthusiasts and fit people belong to the Good and Excellent category. On the other hand, obese and overweight people may perform Poor to Very Poor. In your case, which group do you belong? Fitness Coaches also have their standards for determining the number of push ups that an individual must perform. There are a lot of factors taken into consideration when they put up these numbers. For example, American College of Sports Medicine was able to gather data based on the point of failure. 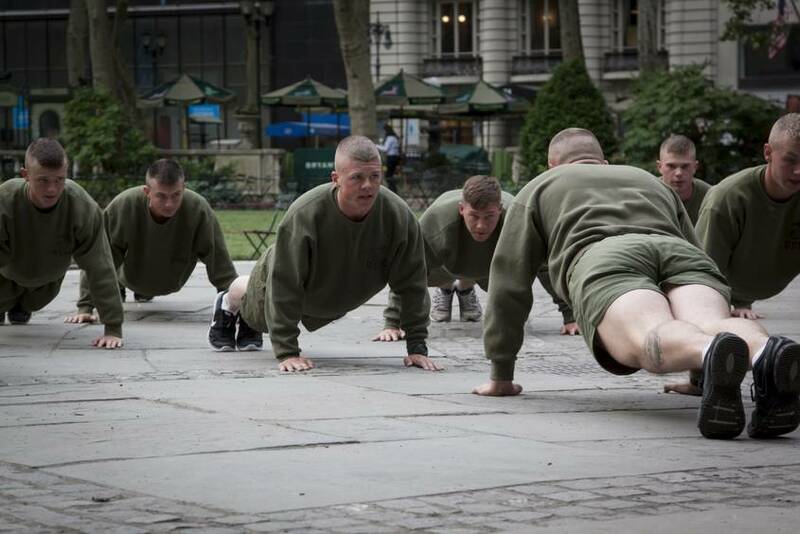 They allowed several groups of individuals perform push up to the point that they cannot do another one. Rests are allowed provided you stay in the “top” position. These numbers are actually the lower end on of the range provided by the ACSM. However, it is worth noting that none of these organizations claim that their data is the universally accepted standard. There is really no exact number of reps that you need to do. You can’t simply push yourself to perform the number of reps just because experts recommended it. Listen to a very reliable expert – your body. As you go along, you will notice a huge difference of what you can today compared to what you can before. Did you like this article? Please let us know by leaving your comments below. Do not want to go to the gym? Start your home gym with these must-have equipment!